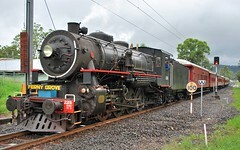 Sunday was the last visit by the QR Steam Train to Ferny Grove. Now that work is beginning on the Railway Station upgrade, future visits will not be possible. The upgrade will remove the additional track required for engine to change direction at the end of the line. I was on the train from Michelton to Roma Street. I hadn't been on this particular train before, and I am not a train fanatic by any means, but it was a good experience. Some friends reported the tickets were sold out, so I am glad I got in early. Ferny Grove Railway Station Upgrade: Half Baked? Ferny Grove Community Christmas Event - Tonight!